Hooray French death! It should be noted that this band has two releases in 2014. One is this EP and the other is a reissue of the band’s 2012 demos packaged together with Swedish death act Inisans. That other release is being handled by Caligari Records while Deathmanicvs Revelation is headed up by our trustworthy friend Iron Bonehead. Enough time spent hopping around lesser known labels will reveal a network of filth, evil, and interconnected madness. By Hook or crook, Skelethal is entering in through your front door. Whether or not intended, the cover for Deathmanicvs Revelation displays a particularly menacing tentacle monster which oddly fits with Skelethal’s Lovecraftian style of death. Though not completely consumed with madness, Deathmanicvs Revelation does promote unending horror just to the tune of old school thrash influenced death. The thrash element should not come as a surprise as the entire sum of the band (two members) comes from one half of French thrash act Infinite Translation. Something is happening in France as the moment and is causing everyone to slip through time tunnels. This would be terrible if the music was not so entertaining and badass. 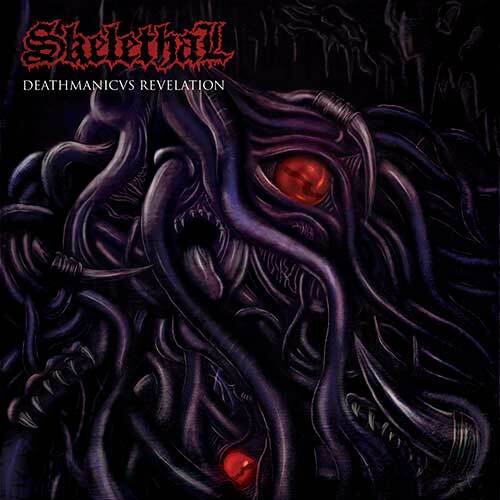 It is easy to see Skelethal as just a humorous side project to an already slightly humorous thrash band. The sound on Deathmanicvs Revelation is a carbon copy of late 80’s and early 90’s death and thrash records. Throughout the record, there persists a nagging feeling that the band members are smiling throughout the entire thing. While Skelethal seems aware of their own image, Deathmanicvs Revelationdoes allow itself to be consumed by its own sound. This is particularly true on the solos and jams of “Deathmanicvs Revelation” and the EP’s highlight “Death Returns.” Skelethal seems intent on living in the past but for some reason this fact can be overlooked. Deathmanicvs Revelation reminds us that dripping death/thrash can be as entertaining as a carnival ride through the mouth of a red eyed skeleton or possibly a Lovecraftian monster.